The classy copper manifold system at right was built by Larry Sawyer of Sawyer Plumbing of Denton (our local installer for large equipment) for Westampton Auto Wash of Westampton, NJ. The system uses three of our regular full-flow compact whole house filters to provide a sediment filter with more than enough flow capacity for Westampton's 60-gallon-per-minute flow requirement. Filters can be installed in a parallel arrangement like unit in the picture to provide virtually any flow capacity that you need, and this is usually much less expensive than installing a single, high-capacity filter. 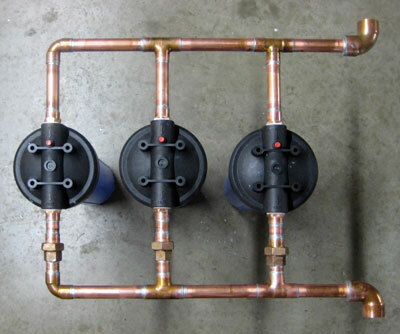 Multiple small filters are simple in design and are usually easier to service than a single large unit. A single compact whole house carbon block filter in the 4.5" X 20" size can comfortably remove chlorine from city water at a flow rate of about 7 gallons per minute. This is enough for most residential customers, but if you want higher flow capacity, or if you want reduced pressure drop, it's easy to install two (or more) units in parallel. A two-unit installation provides double the flow capacity of one and greatly reduces pressure loss. Sediment filters, which have a much higher flow rate than carbon block filters, can, of course, be used in parallel to achieve much higher flows. Each of the pleated 20-micron filters used in the car wash filter above has a manufacturer's suggested limit of 25 gallons per minute, so the three more than satisfy the car wash's 60-gallon requirement. Multiple filters are often installed in series as well as in parallel. In a series arrangement, the water pass through one filter then the other for enhanced contaminant reduction. Identical filters can be used to reduce problem contaminants, or a carbon filter preceded by a a sediment filter — the most common series format — treats both sediment and chemicals. The sediment cartridge protects the more expensive carbon block and adds to its service life. If you have questions, or if you'd like help in sizing or planning a multi-filter installation, don't hesitate to call us at (940) 382-3814.